Scroll down to see the top not-for-profit colleges offering accounting & finance degrees online. The Raymond J. Harbert College of Business at Auburn University offers a Bachelor of Science in Accounting degree that can be pursued online. This is the same AACSB-accredited program that is available to on-campus students. The program is designed for students who already have a non-accounting undergraduate degree who wish to shift to an accounting career. The program also completes the educational requirements for the CPA exam. On the graduate level, the university offers Master of Accountancy (MAcc) and Master of Science in Finance degrees online. The MAcc program can be pursued on a part-time (five semesters) or full-time basis (three semesters). Online and on-campus students are required to participate in a three-day onsite residency during their final spring semester. Bentley University offers a fully online bachelor's degree in business administration that is designed as a part-time cohort program. There are five sessions each year and students take one 8-week course per session. Students who can transfer 60 college-level credits to the program are required to complete only 16 additional courses in order to earn their degree. Core business courses include the following: global strategy, law ethics and social responsibility, management communications, management of information technology, organizational behavior and leadership, and supply chain management. There is a two-day on-campus experience held once a year. The university offers an alternative opportunity for students who cannot attend this session. With continuous enrollment, most students can complete the program in just over three years. Creighton University has an online Master of Finance program that students can complete in as little as two years. Students can take all their classes online or mix online coursework with classes delivered on campus. The 33-credit program requires students to complete 11 courses, including eight core classes. Students can enter in the fall, spring, or summer semester, and applications are considered on a rolling basis. Applicants must have a bachelor's degree and must submit GMAT scores, resume, personal statement, and two recommendations. Students who want the depth of a master's in finance with the breath of an MBA program can earn both in the 48-credit MBA + MFIN dual degree program. DePaul University's online Master of Science in Accountancy is designed for students who want to prepare for the CPA exam. Students who take two classes per term can complete the program in two years, and some individuals may be able to waive some classes and finish even faster. Classes are delivered in a completely asynchronous format in 11-week sessions and include a mix of videos, discussions, quizzes, and other assignments. The curriculum for the MSA requires students to complete 12 courses, although students who do not have a business background may have to take four additional courses. The program offers multiple start dates each year, and there is no requirement for GMAT or GRE scores. Florida International University's fully online Bachelor of Business Administration program offers a finance track for students who are interested in pursuing a career or further studies in banking, business, corporate finance, or investments. Students are required to complete 60 credit hours of upper division coursework that include business, major (finance), and elective courses. The following core financial courses are required: commercial bank management, financial markets and institutions, financial risk management (financial engineering), intermediate finance, and securities analysis. Students can choose management/banking or finance/real estate courses as part of their elective coursework. FIU pairs each online student with a success coach to facilitate program planning and completion. Students are given the option of beginning the program in the fall, spring, or summer term. George Mason University's online Master of Science in Accounting is a part-time program students can complete in as little as two years. Courses are offered in a module format that allows students to enroll in two courses every 10 weeks. The curriculum calls for 30 credits, with half of the courses electives. Students move through the program in a cohort, ensuring they develop a professional network of peers. All students are required to take a one-week global residency class that is led by a GMU instructor. Previous residency locations have included London, Frankfurt, and Prague. Applicants must have a bachelor's degree in accounting, business, or a similar field. GMAT or GRE scores are required. Students in the Flex MBA program at Lehigh University can concentrate in finance. The Flex MBA can be completed almost entirely online, although students begin the program with a mandatory weekend orientation. Coursework is not always asynchronous; students may be required to attend scheduled live sessions via the internet. This is a 36-credit program that ends with a capstone project. Students may attend part time, which takes about three years, or accelerate the pace by taking more classes each semester. Applicants do not have to have an undergraduate business degree, but they are required to complete prerequisites in financial accounting, statistics, and economics. Students can enter the program in the fall, spring, or summer. Missouri State's College of Business offers a Bachelor of Science degree in finance that can be pursued online. Students accepted to the program complete general education and College of Business requirements, in addition to taking 32 to 33 units within the major. The finance curriculum includes courses such as intermediate financial management, investments, international financial statement analysis, and business enterprises, rights, and liabilities. Students are trained for careers in a variety of financial fields including investment management, personal financial planning, banking, and corporate and public finance. Missouri State University is recognized by the Chartered Financial Analyst (CFA) Institute. Finance majors are prepared to sit for the CFA Level I exam, which is the first step in receiving their CFA Charter. With new federal requirements for financial planners, earning the Certified Financial Planner (CFP) designation is all but necessary to advance in the profession. The Master of Science in Family Financial Planning (FFP) will help graduates stay in the game. Designed as a part-time program that takes several years to complete, the 36-credit graduate degree is made up of 10 core courses, including a practicum, and two electives. For those who need the CFP on their resume right away, the 18-credit FFP certificate pulls six of the most essential courses from the core curriculum. It covers topics ranging from estate planning and retirement planning to investing and income tax. The BS/BA in Economic Studies at the OSU Ecampus has two concentrations, one of which is Managerial Economics. That track builds upon the 32 credits within the Economics core curriculum by adding courses such as Financial Accounting and Introduction to Financial Management, so graduates should be able to snag jobs in the business sector. For a resume boost, Oregon State's Graduate Certificate in Financial Planning is a one-year hybrid program that meets twice per term in Portland. Four of the seven required courses within the 27-credit program contain "financial planning" in the title, with the others dedicated to Corporate Finance, Investments, and Personal Selling. Graduates are qualified to sit for the Certified Financial Planner exam. The Master of Science in Financial Services degree offered by the Haub School of Business at St. Joseph's University is accredited by the Association to Advance Collegiate Schools of Business (AACSB) as well as the Certified Financial Planner Board of Standards, Inc. To date, it is the only regional master's program in finance that is both AACSB-accredited and CFP-certified. The degree can be pursued online. Students accepted to the program gain critical expertise in key areas such as portfolio management, mergers and acquisitions, financial institutions and capital markets, and international finance. Most students complete the program within two years and six months. Pre-requisite requirements can be satisfied through the transfer of qualified undergraduate credits, challenge exams, or completing the required coursework. The Peter J. Tobin College of Business at St. John's University offers an online Master of Science in Accounting degree. The program satisfies the educational requirements for the Certified Public Accountant (CPA) exam in the State of New York. Students applying for admission to the program must have completed an undergraduate business degree from an accredited institution. The 30- to 33-credit program is designed to be completed in one year and students have the option of following a part-time or full-time plan of study. The curriculum includes coursework that train students to analyze exposures and risks, identify and measure financial information, use technology to leverage accounting strategies, and understand the impact of national and global issues on local business. The Master of Accountancy (M.Acc.) degree at Stetson University is available online and can be completed after just one year of study. The program is designed as a cohort and offers several starting dates throughout the year. The curriculum includes coursework in essential function areas such as information systems and business law, in addition to graduate-level accounting courses. Students who pursue the program take classes in information technology and business strategy, managerial accounting, contemporary issues in information systems and controls, and tax research. Course content can be accessed asynchronously, at the times when it is most convenient and practical for individual students. However, some instructors require real-time chat sessions or group discussions. The Stetson School of Business is an AACSB-accredited institution. Texas Tech University has a fully online program for a Graduate Certificate in Charitable Financial Planning, which is designed for professionals who work in fields such as financial advising or in fundraising for nonprofits. This is a four-course, 12-credit program, and credits earned for the certificate can be applied to the Master of Science in Personal Financial Planning. Applicants must have a bachelor's degree, but there are no other application requirements for the certificate except for proof of English proficiency from international students. Undergrads at Texas Tech can complete a minor in personal finance through online classwork. The minor requires six specific classes for 18 credits. The University of Texas at Dallas offers all the courses for the Master of Science in Accounting online. However, Texas residents who are preparing for the CPA exam are required to take at least 15 of the required credits on campus under rules established by the Texas State Board of Public Accountancy. Residents of other states should check their state requirements if they plan to take the CPA exam after completing an MS in Accounting. The MS in Accounting is a 36-credit program, and most students can complete the degree in 18 to 24 months. The program is open to students with any undergraduate major, and applicants must submit GMAT or GRE scores. The University of Alaska in Fairbanks offers an online Associate of Applied Science degree in applied accounting that provides students with a gateway to a four-year Bachelor of Arts program in accounting. Students are prepared for entry-level positions in bookkeeping, payroll accounting, and in payables and/or receivables. A one-year certificate in accounting technology is also available online. The university offers a 15-credit occupational endorsement as a financial services representative that can be pursued online in one semester. Students who complete this program will have 50 percent of the required credits for the applied business management certificate in finance. After earning the endorsement, students have the option of enrolling in an internship course in order to gain practical, hands-on experience in the field. The online MS in Accounting at UCONN is one of the top 10 non-MBA business programs in the country, according to U.S. News and World Report. To get in, applicants need at least eight accounting courses on their transcripts and a 500+ score on the GMAT. Those who make the cut typically start on campus in May with a month-long about professional responsibilities. They take the remaining nine courses online over two to three semesters, or enroll part-time as they work. Aside from the residency course and one other, all classes are electives, allowing students to delve into issues of taxation, data analytics, ethics, fraud and information systems. There is no capstone. For Accounting or Finance in the Mile High City, look to the MBA@Denver. Entrants who choose either discipline as a concentration merely add eight credits to a 60-credit MBA. The curriculum already includes required courses like Financial Reporting and Accounting as well as Managerial Finance. It culminates with a team-based capstone that asks students to pull from everything they've learned to solve a real organization's challenge. The program recruits working professionals for four start dates per year. The online Master of Science in Finance degree at the University of Houston in Clear Lake (UHCL) is a 36-graduate-hour program offered through the School of Business. The curriculum includes required coursework in key financial topics such as: management science and operations, security analysis, economic policy and applications, international finance, financial administrative policies, financial policy, and the structure of financial statements. Accounting and business elective courses may be taken with the approval of the student advisor. Students are given the option of completing a capstone project or writing a thesis in order to graduate from the program. UHCL is authorized to offer online programs to students residing in all states except for the following: District of Columbia, Pennsylvania, Puerto Rico, and Wisconsin. Illinois' on-ground Master of Science in Accounting (MSA) was ranked third-best in the country by U.S. News and World Report in 2018. The online version is an 18-36 month program aimed at working professionals with a baccalaureate in any discipline, provided their undergraduate transcripts feature a few business and accounting courses. In addition to five required courses, students choose three electives. One of them must be from outside the field of accounting. There is no capstone or thesis requirement. The program's core curriculum integrates financial reporting, auditing and taxation. To focus exclusively on the latter, enroll in the online MS Tax degree. UMASS runs BS degree completion programs in Accounting and Finance; students must transfer in at least 27 credits. After satisfying their general education and elective requirements, students in either program take 11 to 12 core business courses. These cover areas such as accounting, management and marketing. Enrollees also branch out into the core courses for the major. For the BS in Accounting, those nine courses cover financial reporting, cost accounting, taxation and information systems. The BS in Finance is more flexible - students have five required upper-level courses and choose another five business or economics classes. Finance is also available as a focus area under the online MBA, which was ranked 12th best by U.S. News & World Report in 2017. The distance education program of the University of Memphis (UofM Online) offers a Bachelor of Business Administration in Accountancy degree that can be pursued completely online or with a combination of online and on-campus coursework. There is also a Bachelor of Business Administration in Finance degree available with two areas of concentration - real estate and business finance. Students accepted to this program also have the option of earning the degree 100 percent online or on campus. As programs offered through the Fogelman College of Business and Economics, the online accounting and finance courses are taught by the same faculty that teach on campus. The Fogelman College of Business and Economics is accredited by the AACSB (Association to Advance Collegiate Schools of Business). University of Miami's Master of Professional Accounting (MPrA) and MS in Finance degrees were ranked in the top 40 of online graduate business degrees by U.S. News and World Report in 2017. The former is a 32-credit program for current professionals. Those new to accounting can ease into the field with the 16-credit Accounting Practice Certificate. Alternatively, students can take a slightly longer MPrA with a CPA track or even pursue Accounting as a focus area under an MBA degree. The MS in Finance is also 32 credits with certificate programs in Corporate Finance and Financial Decision Making for those wanting to specialize. Miami's MBA program also offers a focus in Corporate Finance. University of South Carolina's Palmetto College runs a Bachelor of Science in Business Administration (BSBA) with a concentration in Accounting. Once students have 45 to 60 credits in general ed areas such as composition, economics and humanities - whether from Palmetto College's four traditional campuses or elsewhere - they can transfer into the online BSBA. Full-time enrollees spend two and a half years learning about financial and managerial accounting, auditing, and foundational business concepts. There is no capstone, but by the end, with a degree issued by USC Aiken, they should be ready to sit for the CPA exam. UT Online's associate degree in Accounting Technology can prepare beginning students to pursue either the Bachelor of Business Accounting (BBA) or an entry-level position. The university reports a job placement rate above 90 percent (with $50,000 starting salaries) for students from its BBA degree. That's in part because in 2015, Toledo's student pass rate on the CPA exam was higher than the national and state rates, continuing a decade-long string of outperforming the average. The BBA is structured so that students only have to choose one accounting elective, but to sit for the CPA exam, they'll need to select an additional elective. All electives are also available via the one-year MS in Accountancy, which is partially online. Villanova's Online MBA with a specialization in Finance is a 48-credit program with a short yet intense on-campus residency during the first year plus two practicums interspersed throughout. Students can do the standard capstone at the end or incorporate a weeklong immersion abroad at a global company. Another distance learning option out of the School of Business is the Master of Taxation (MT), which mixes legal and accounting coursework. The school's online graduate business programs, including the MT, were ranked fourth in the country by U.S. News & World Report in 2017. Washington State University offers a fully online Bachelor of Science in Accounting degree through the Carson College of Business. Students accepted to the program must first be certified in business administration with a concentration in accounting before taking upper-division business and accounting classes. The following courses must be completed for advancement in the program: financial and managerial accounting, business statistics, finite math and business calculus, and law and the legal environment. Once eligible to take upper-division courses, students enroll in classes that fulfill the business and accounting requirements such as the principles of management and organization, business strategy and policy, intermediate accounting, taxation, and auditing. Finance is offered as an area of concentration for the university's Master of Business Administration (MBA) program. Thinking of earning your accounting or finance degree online? Wondering how to distinguish the first-rate from the third-rate? Never fear, help is here! 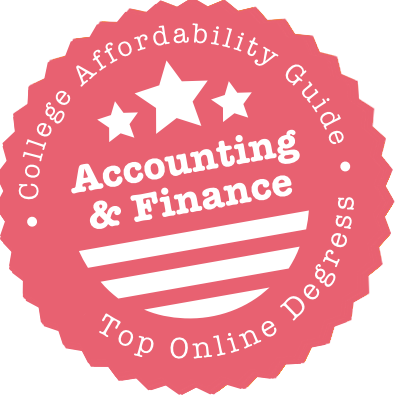 In our guide to online accounting & finance programs, you’ll find advice on choosing an accredited program, transferring credits, fulfilling the education requirement for the CPA, and much more. These are the types of questions to ask yourself as you compare programs. Need a little more guidance before you make a decision? We provide a 360º overview of degree types, AACSB accreditation, the CPA, and professional certifications in Affordable Accounting & Finance Degrees. This page includes a complete guide to the CPA process. Do You Want an AS, AA or an Applied Associate Degree? An AS or AA is often used to advance to a bachelor’s degree; an AAS or AAB can get you working immediately. For example, UAF’s Online AAS in Applied Accounting prepares graduates for entry-level positions in bookkeeping, payroll accounting, and in payables and/or receivables. Will Your Online Credits Transfer Easily? Remember that you may want to use your course credits toward a bachelor’s degree at the same university, a program at a local university, or an online BS or BBA in another state. Make a shortlist of those options and then check to see that there will be no problem with transfers. For instance, credits from UT’s Online AAB in Accounting Technology can easily be applied toward UT’s Online BBA in Accounting. Does the Online Associate’s Program Arrange Internships? These can be especially helpful if you want to work in an entry-level accounting or finance job after graduation. That way you can gain relevant professional experience while you study for an online bachelor’s degree. Is it a Degree Completion Program? Online bachelor’s degrees in accounting and finance often are. This means you will need to earn your associate degree and/or general education credits elsewhere. For example, students in Bentley’s Online BBA can transfer up to 60 college-level credits from any regionally-accredited institution. Some universities like MSU even have special reciprocation agreements with local community colleges. Always ask about transfer policies. Does the Program Have a Strong Syllabus? Will you be able to take online minors in relevant areas (e.g. forensic accounting)? Will you be exposed to practice-based learning in the coursework? Will you work on hands-on projects with real-world businesses? We also recommend you pay attention to the fine print. On-campus electives are not always available online. Does it Prepare You for CPA Licensure? If you’re planning to be licensed as a CPA, remember that you will need 150 credit hours (most traditional bachelor’s programs are only 120 credit hours). Universities have different ways of approaching this challenge. For example, Auburn’s Online BSBA in Accounting is only open to second degree-seeking candidates who would like to fulfill CPA educational requirements. USC’s BSBA in Accounting is a degree completion program (with CPA preparation) that takes ~2 ½ years for a full-time student to complete. If it’s a traditional 120-credit program, you may need to earn a graduate certificate or master’s degree as well. Does the Online Program Match the State Board of Accountancy’s Education Requirements? Every state/jurisdiction has its own set of education & work experience requirements for CPA licensure. Generally speaking, that means your degree must come from an accredited institution and your 150 credit hours must include accounting & business coursework. If you have any doubts about an online undergraduate program, check with the Board. You may need to be on-campus for at least some of the credits. Are Specific Concentrations Available? If you’re using your master’s to improve your job prospects, keep an open mind. You may be able to combine finance & accounting coursework with classes in business administration & executive leadership. For instance, the University of Denver allows students to add 8 credits of an Accounting or Finance Concentration to its finance-focused Online MBA. Does it Prepare You for CPA Licensure? An online master’s degree can help you accrue the 150 course credits needed to become a CPA, but it’s important to remember that each state has its own education & work experience requirements. Fortunately, schools are aware of this issue. For example, St. John’s University’s Online MS in Accounting fulfills all of the accounting education requirements for the CPA exam and the requirements to be licensed as a CPA in New York. And because of St. John’s top-tier accreditation, many other states accept the MSA as meeting their requirements for licensure. Similarly, UMass Amherst has an MSA that is recognized as fulfilling the educational requirements for CPA licensure in New England states and New York. Does it Prepare You for Professional Certifications? Plenty of online programs will! For example, OSU’s Online MS in Family Financial Planning and St. Joseph’s University’s Online MS in Financial Services are Certified Financial Planner (CFP) Board Registered Programs that meet the education requirements for the CFP exam. Universities should always state this info clearly. You can cross-check with the certification body as well. Do You Have to Be On Campus For Any Credits? This may come into the play if you’re working toward the CPA. For example, UT Dallas offers all the courses for its MS in Accounting in an online format. However, under rules established by the Texas State Board of Public Accountancy, Texas residents who are preparing for the CPA exam must complete at least 15 of the required credits on campus. Will You Make Valuable Contacts? Strong online programs will find ways to help you build your business network. For example, in GMU’s Online MS in Accounting, students move through the degree in a cohort. In addition, all students get together for a one-week global residency class in a major city. In UT Dallas’s Online MSA, students work on accounting consulting projects with local business partners. Does it Appear in Online Rankings? Poets & Quants and Princeton Review post annual lists of Best Online MBA Programs, but U.S. News & World Report’s rankings for Best Online MBA and Best Online Graduate Business Programs can also be helpful. If you dig into the university’s profile (by following the link with its ranking number), you’ll find statistics on applicant test scores, graduate employment rates, average student debt, and much more. Would You Prefer a Thesis or a Research Project? PhD programs are usually thesis-based; DBA programs tend to go for research projects. If you rely on constant feedback, both may be difficult from a distance. For the PhD, find out who your thesis supervisor will be—he/she should be comfortable with virtual learning. For the DBA, discover what previous online students have done. Did their research projects have real-world applications? Are they now working in high-level finance or accounting positions? Will You Have to Pay for Visits or Residencies? Online finance & business programs at the doctoral level often include an on-campus component. These can be great for improving your educational experience, but tough on the pocket (especially when you’re forking out for tuition & fees). Budget for extra expenses. Does the University Have Ties to Useful Organizations? Universities often take advantage of special partnerships to enrich doctoral degrees. For example, an Online DBA with an Accounting Concentration might include virtual meetings with Executives in Residence or input from local financial firms (e.g. Ernst & Young) on a student’s research project. Always ask if university partners are involved in online programs. Will Your Credits Count Toward the CPA? If you’re earning an online graduate certificate to build up your 150 credit hours, be sure all your certificate credits will meet your state’s education requirements. Don’t be afraid to ask your State Board of Accountancy if you have any doubts. Does it Prepare You for Professional Certifications? To save money, lots of students use online graduate certificates to fulfill education requirements for professional certification (e.g. CFP, CMA, CIA, etc.). Universities should clearly state how & why their program meets certification requirements. For instance, OSU’s Online Graduate Certificate in Financial Planning is a Certified Financial Planner (CFP) Board Registered Program. How Specific Do You Want to Be? There’s tons of choice in the world of online graduate certificates, so have a look around. You may be able to find a program that’s ideal for your career goals. For instance, TTU’s Online Graduate Certificate in Charitable Financial Planning is a short, targeted certificate for professionals in financial advising or non-profit fundraising. Will Your Credits Transfer to a Degree? Always check if your online certificate credits can be transferred toward a relevant online degree or a convenient program in your area. You want to keep your options open for the future. For example, Texans should know that credits from TTU’s Online Graduate Certificate in Charitable Financial Planning can be applied to the on-campus MS in Personal Financial Planning. Can You Enroll if You Live Out-Of-State? Most universities have reciprocity agreements that allow students from other states to enroll in online programs. But there are exceptions! For example, UHCL is authorized to offer online programs to students residing in all states except for Pennsylvania, Puerto Rico, Wisconsin, and Washington D.C. Does it Work With Your Schedule? Some online programs in accounting & finance require that you log-in at a specific time for classes and seminars. For example, in Lehigh’s Online Flex MBA, students may be required to attend scheduled live sessions via the Internet. In Stetson’s Online MAcc, some instructors require real-time chat sessions or group discussions. What is the Credit Transfer & Prerequisite Policy? Whether it’s a bachelor’s degree completion program or a master’s degree, you should find out the school’s policy on credit transfers. In the case of an online graduate program, you may need prerequisite undergraduate credits in accounting & math and GRE/GMAT scores before you will be considered. Will it Connect You with Accounting Firms & Financial Companies? To make the most of your money, look for programs that include networking opportunities, consulting projects & internships. For example, Villanova’s Online MBA with a Specialization in Finance includes an on-campus residency and two practicums. Students can do the standard capstone at the end or incorporate a week-long immersion abroad at a global company. Who is Teaching Your Online Course? Universities often rely on part-time adjuncts to teach online classes. This isn’t a bad thing—adjunct professors often have great jobs in the fields of finance & accounting. You can learn more about their work by searching the course schedule for their names and cross-checking their expertise on LinkedIn. Does the Program Offer Support to Online Students? This is especially relevant when we’re talking about an accounting or finance program that includes heavy technical subjects. For example, FIU pairs each distance learning student in its Online BBA with a success coach. Can You Find Job Placement & CPA Pass Rates? Strong programs love to show off their achievements. For instance, UT likes to boast that its graduates pass the CPA exam at rates that exceed both state & national averages. You can always ask to see the numbers if they’re not posted online. Are There Hidden Costs? Read the tuition & fees page very carefully. Universities sometimes require online students to pay hefty technology & distance learning fees. Especially when it comes to graduate programs, you may end up paying the same or more than on-campus students. Is Financial Aid Available to Online Students? Most online undergraduates will be eligible for financial aid, but it’s always best to check. If you’re looking at online graduate programs, find out if you qualify for university scholarships and private funding. The websites for the Department of Accounting and the Business School are two good places to start your research. Do Online Students Receive a Tuition Discount? Public and state universities usually offer tuition breaks to online undergraduates (and sometimes to graduates) who reside in the state or in neighboring states. Policies vary between schools, so visit the tuition & fees page for details. If you have any concerns about a university offering an online program in accounting or finance, have a look at our Online State Rankings. Under each state, we have a detailed list of Online Schools with Accreditation & Quality Concerns. The following universities appear in our rankings of Top Affordable Schools for Accounting & Finance and Top Online Schools for Accounting & Finance. That means they have met some extremely tough criteria for quality, flexibility, price, and use of financial aid money (you’ll see a CAG Score next to their profiles). Tuition costs for MSU Springfield’s Online BS in Finance (Finance Option) are listed in the Office of the Registrar. Missouri residents and non-residents pay the same rates. Scholarships are available to incoming freshmen and transfer students. You should also take a look at the scholarship search tool and filter your major under “Categories.” There are special funds available to Finance undergraduates. Want to save even more money? MSU has a slick transfer agreement with Ozarks Technical Community College—you can complete an Online AAB with OTC and transfer your course credits easily into the Online BS in Finance. OSU’s online programs in financial planning are CFP Board-approved and handled through the multi-university Great Plains Interactive Distance Education Alliance (Great Plains IDEA). All Great Plains IDEA courses have a common per credit hour price, and there’s no difference in resident and non-resident tuition. That price covers all course costs except textbook purchases. OSU doesn’t offer any specific scholarships to online graduate students, but all Great Plains IDEA students are eligible for the $1,000 Great Plains IDEA Student Excellence Award. Military & Veterans should also check out the Great Plains IDEA section on Financing College. TTU’s banner accounting & finance program is a short, 12-credit Online Graduate Certificate in Charitable Finance. Tuition costs are in line with many other graduate certificate programs, but Texas residents get hefty discount thanks to state subsidization. UT’s Online MS in Accounting is administered by the Naveen Jindal School of Management (JSOM). JSOM has a full rundown of tuition & fees for its MS programs (online students pay an extra distance learning fee). Tuition is on a sliding scale—the more credit hours you take per semester, the cheaper the credit hours will be. Texas residents receive a substantial tuition break. UT Dallas also offers a waiver for residents of Oklahoma. Want the best news? JSOM has a ton of graduate scholarships on the table, including funds that are earmarked for accounting students. These same students may also be eligible for a variety of outside scholarship programs. In addition, non-residents who receive a competitive scholarship of $1,000 or more from JSOM may be eligible for in-state tuition. The Isenberg School of Management has a complete rundown on UMass Amherst’s online accounting & finance programs, including handy links to financial aid applications and military & veterans services. For the Online BBA degree completion program, tuition rates are the same for all students: in-state, out-of-state and international. For the Online MBA, tuition rates are similarly fixed, but active military and U.S. veterans may waive the application fee. Full-time Massachusetts state employees, their spouses, and unmarried dependent children may also be eligible for a 50% reduction on class fees for online courses. For the Online MSA, per credit tuition rates are less than the Online MBA. However, if you choose to take any MBA electives (1-2 are permitted), you’ll be required to pay the higher price for those courses. Active military and U.S. veterans may waive the application fee. Online undergraduates should be sure to apply to the popular Isenberg Undergraduate Scholarship Program. More than $450,000 in scholarship aid is awarded to Isenberg School students under this program (primarily to sophomore and junior students)! The Office of Financial Aid Services has further advice for graduate students. UIUC’s Online iMSA and Online MS in Tax fall under the auspices of the Gies College of Business. However, you’ll find an entire section on online tuition & fees, as well as advice on financial aid & paying your bill on Illinois Online. The iMSA has a per credit hour cost; the MS in Tax is a flat rate for the whole program. In addition, many online and off-campus courses come with an extra, non-refundable fee. There are no specific scholarships available to online graduate students, but Coursera financial aid is available for the self-directed course components of the iMSA. WSU’s Online BBA in Accounting and Online MBA with a Concentration in Finance are part of the Carson College of Business. However, online undergraduate tuition rates and online graduate tuition rates are laid out in full on WSU’s Global Campus—the more credits you can take per semester, the cheaper your costs. Washington State residents receive a modest tuition discount for the BBA, but there is no in-state discount for the MBA. Like the look of the BBA? Students who major in accounting qualify for Department of Accounting scholarships and may also be eligible for undergraduate scholarships from the College of Business. WSU recommends you ask the Department of Accounting directly to see if aid is currently available. Finally, it’s important to note that all online students (new or continuing) qualify for the ASWSU Global Scholarship and the ASWSU Global Internship Scholarship. You can also use WSU’s handy Scholarship Search to look for university aid or outside funding. Opt for Schools With Regional Accreditation: This category includes state schools, Ivy League, and public/private universities. Going to a regionally accredited school will make it easier for you to transfer credits and use your online coursework as the education requirement for professional certification exams. Look for AACSB Accreditation: AACSB is the gold standard for business & accounting programs. And it doesn’t matter whether your program is online or on-campus—if the school has received AACSB accreditation, you’re covered. You can search a complete List of AACSB-Accredited Universities and Schools on the AACSB website. We also list the accreditation under each of our rankings. AACSB Accreditation Can Help With the CPA: Although this is not always mandatory, State Accountancy Boards like to see that your education requirement (i.e. accounting & finance coursework) comes from an AACSB-accredited program. To avoid any hiccups, we recommend you always choose an AACSB-accredited online program. It may put you in the “fast lane” to CPA licensure. Make Sure Your Online Program Meets Your Licensure & Certification Goals: If you’re thinking of taking an online program to prepare for CPA licensure, ask if all the course credits will count towards your 150 credit hours. If you’re prepping for a specific certification, find out whether the online coursework will meet the education requirements and be relevant to the exam topics. Remember that CPA Licensure is Handled by Your State: Each State Accountancy Board has its own list of education requirements, which may affect online programs. (View a list of State Accountancy Boards.) For example, under rules established by the Texas State Board of Public Accountancy, Texas residents who are preparing for the CPA exam must complete at least 15 of the required credits of the Online MS in Accounting on campus. When in Doubt, Cross-Check with the Certification Body: Some certification bodies have a search function on their website where you can find on-campus & online programs that meet the certification education requirements (e.g. List of CFP Board-Registered Programs).